Theological including the New Image of the Church, A Brief Theological Study on Indulgence, Marriage as a Sacrament, and On the Theology of Hope. - Publisher The most influential theological writing of the 20th century, in one groundbreaking series. 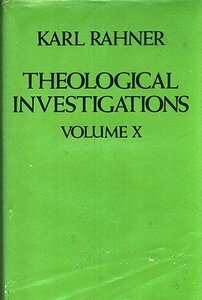 About "Theological Investigations Volume 10"
The most influential theological writing of the 20th century, in one groundbreaking series.